Who says traveling with food allergies can't be a fun adventure? 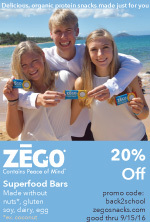 I am absolutely amazed at the new products we constantly are finding as we navigate through our travels. On our most recent airplane trip, we found a candy item new to us. I am not a huge licorice fan, but this is a brand I hope to find locally. Just as is stated on their website, this licorice is soft, chewy, and delicious. Even better is the fact that it appears to meet our family criteria of being milk-free, egg-free, and totally nut-free. 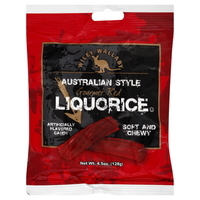 Wiley Wallaby Australian Style Gourmet Red Liquorice, manufactured by Kenny's Candy Company, Perham, MN. For more information, contact: Kennys Candy or 218-346-2340. All products manufactured by Kenny's Candy Company contain wheat and soy ingredients. No products manufactured or packaged in our facility contain peanuts or any other nuts, milk or eggs. Kenny's Candy Company uses processing aides. 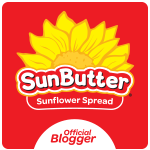 However, processing aides are exempt from declaration on the packaging labels of finished goods in the USA and therefore are not listed in our ingredient statements. For more information, contact Kenny's Candy Company at (218) 346-2340 . I hope I don't have to take another plane ride just to find them!